What’s stopping you shine more of your light as a leader? Most leaders usually start their journey of development with a bang, a difficult team member, an overly challenging MD. The difficulty of not knowing what to do or how to show up and still have integrity can draw us towards a journey of growth, or failure. The books, the training courses all play their role in helping to develop new skills. They did for me when I was first learning how to become a Manager and then a Leader. What I came to realise over time though, is that truly great leadership doesn’t come from following an external resource or model. It comes from going within. The journey to great leadership requires a person to get really curious about themselves. To see both their light and their dark. To cultivate an attitude of awareness, acceptance and growth (yes all at the same time). To be constantly re-meeting their developed self for a new and real conversation about what next. The Brave Souls philosophy is driven by a desire to make the world a better place by helping people, parents, leaders to connect with their own inner wisdom, to have the confidence to do things their way and to have those brave conversations. But what do they mean in business and how can you apply them to your journey with developing your own leadership style. Here are our thoughts on leading the Brave Souls Way. The first challenge in being able to speak your truth is cultivating the art of listening. In order to really listen and be present for another, we first have to be able to listen to ourselves. Most leaders spend 90% of there time trying ‘fix’ others when really their focus needs to be 70% on self, 30% on others. In order to listen to ourselves we have to be able to go within. To see all of ourselves, even the bits we don’t like, to talk to our fears, and own our shame. We have to cultivate the ability to separate what’s true for us and what’s a lie. Once we’ve learnt to listen to ourselves, we can start having a real honest conversation with our team members. Speaking from our heart not from our wounded ego. Meeting the other person where they’re at, without need to fix or change, only to reflect, observe and guide. Qn’s – What’s your inner wisdom whispering to you about how you’re succeeding and failing as a leader? Why not spend 20 minutes journalling what surfaces and see what you find. What behaviours are contributing to your failings as a leader that you could be working on instead? There is NO one way of leadership thats right. There is only the way that’s right for you in order for you to be at your best. – When I’m at my best with people I feel relaxed around, what kind of leader am I naturally? – When I’m with people I trust, that get me, what are my core strengths? – If I was living bravely, what else is possible for me as a leader that I can and want to grow into? – What culture, office and approach to management would best suit my style of leadership in order for me to shine my leadership light for more of the time? 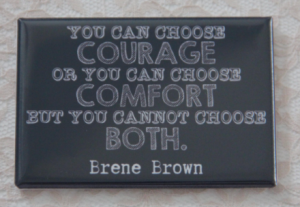 The word Brave often leads people to think about courage, daring greatly, throwing themselves into the arena. The word brave in the context of being a Brave Soul leader actually means to be vulnerable. Most people shy away from their vulnerability. We haven’t been taught how to ‘do’ vulnerable because we’ve been told its a bad thing, should be swept under the carpet, covered by your game face. We’re taught that we need to have all the answers, to be perfect, to be right, to lead by example. The challenge with that approach is that we’re not operating in a certain world. It’s constantly evolving, full of uncertainty, complexity, volatility and constant change. We cannot be expected to have all the answers in this climate. – Where are you putting pressure on yourself to have all the answers? – What failings and imperfections do you have that would be liberating to share? – In what situations and with who do you feel most vulnerable? – What sits underneath those interactions, what are you most afraid they’ll find out about you? The BraveSoul leaders journey is not for the feint hearted. If you’re going to do this work, it’s definitely worth investing in a coach or therapist to hold the space for you and ask the questions that need to be asked. They’ll help you to hold it lightly, to stay above excessive analysis and to find the light in the dark.